Use this sheet to help older students organize their thoughts and processes before taking exams. 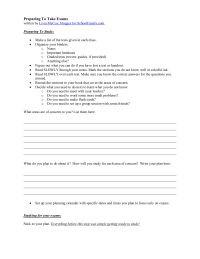 Prepared by blogger and educator Livia McCoy, the sheet includes sections for listing areas of concern and pointers for organizing. 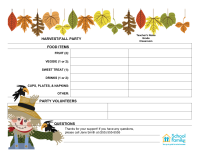 Use this sign-up sheet as an option for securing donations and volunteers for a harvest/fall classroom party. Simply tape the form to your child's classroom door or make it available at events where parents are gathered. 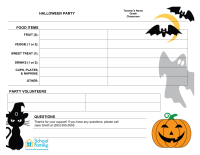 Use this sign-up sheet as an option for securing donations and volunteers for a Halloween classroom party. Simply tape the form to your child's classroom door or make it available at events where parents are gathered. 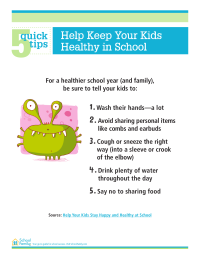 If you have children in school, you know how easily they seem to get sick. But it doesn't have to be that way -- use these 5 quick tips to help minimize illness. Research shows that when parents are involved in their kids' education, kids do better in school. 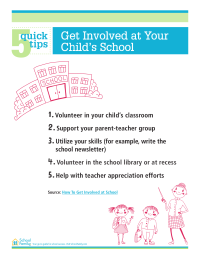 Use this printable sheet for 5 quick tips on how to get involved at school.